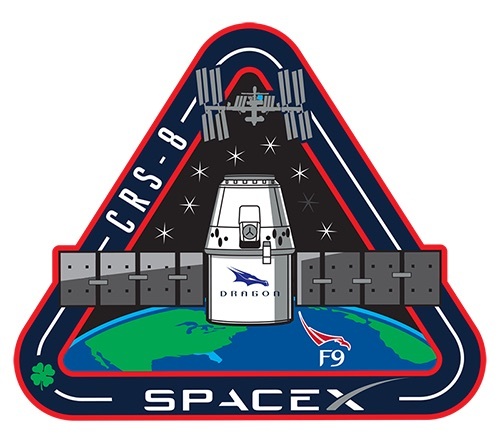 Dragon is the third cargo craft to arrive at the Space Station in a period of three weeks, wrapping up one of the busiest periods of vehicle arrivals in Station history with plenty of cargo transfer operations on the crew’s schedule for the coming month. Delivering to ISS 3,136 Kilograms of cargo, Dragon will also return a significant amount of experiment materials and components to Earth – allowing the laboratory freezers aboard ISS to be emptied out after samples accumulated for nearly a year while Dragon missions were on hold. Berthing of the Dragon is planned later on Sunday as the spacecraft takes its spot on the Station’s Harmony module, next to the Cygnus spacecraft currently attached to the Unity Node – marking the first time both US Commercial Cargo Vehicles are sitting side by side in space. It marks the second time in ISS history that six vehicles are present at the Station with two Progress and two Soyuz craft docked to the Russian Segment in addition to the two American spacecraft attached to the Earth-facing ports on the US Segment. Delivered to ISS aboard the Dragon is a group of mice as part of the third Rodent Research Study conducted on ISS, examining a possible remedy of bone and muscle loss in space flight and muscle-wasting diseases on Earth. 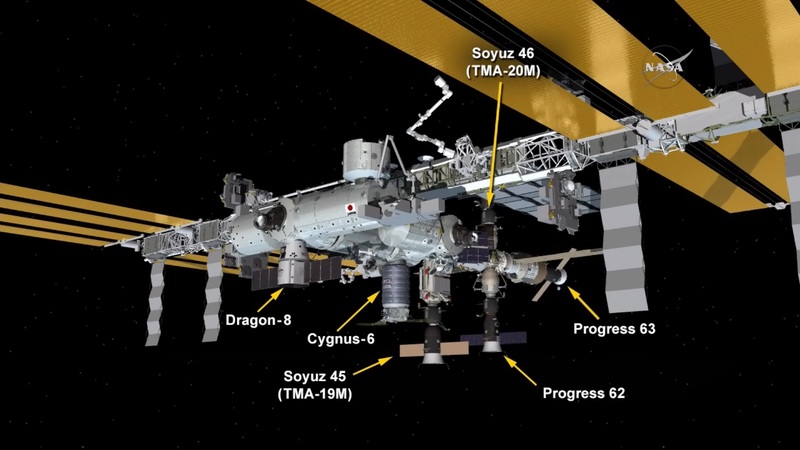 Also packed into the Dragon is the next set of plants to be grown in the Station’s Veggie facility, Tokyo Bekana cabbage to be grown to check whether lessons learned in the first two Veggie studies will yield a more efficient growth. Sitting in Dragon’s Trunk is the Bigelow Expandable Activity Module – to be attached to the Node 3 module late next week for a two-year stay at ISS to demonstrate expandable space habitats in the actual spaceflight environment. 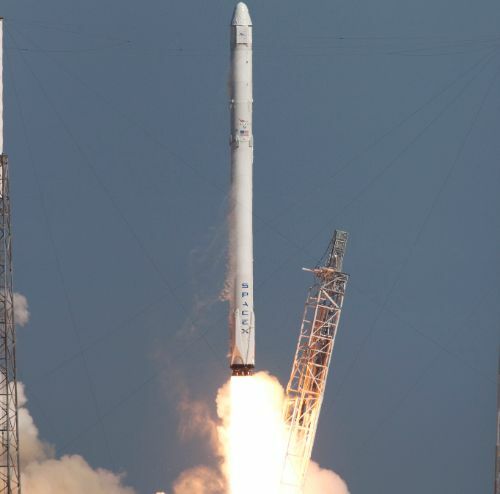 The Dragon blasted off from Florida’s Space Coast atop a Falcon 9 FT rocket on Friday at 20:43 UTC. The ten-metric-ton capsule received a smooth ride into orbit while Falcon 9 secured its place in space history as the first space launch vehicle to successfully complete a landing at sea, touching down smoothly on SpaceX’s Autonomous Spaceport Drone Ship to be re-used for a future flight. Arriving in an orbit of 209 x 353 Kilometers, inclined 51.6°, Dragon successfully completed its first steps, deploying its two solar arrays, priming its thruster system and opening up the GNC bay door to expose the vehicle’s star trackers for attitude determination, the vehicle’s rendezvous navigation sensors and the grapple fixture. 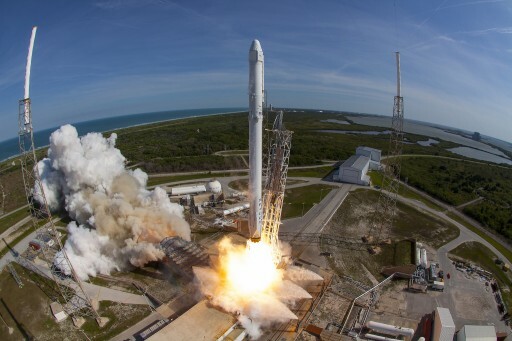 With a clean bill of health, Dragon was cleared to begin raising its orbit early on Saturday (UTC) with a small correction maneuver to make up for minor insertion inaccuracies by Falcon 9 followed by the first Height Adjust and Coelliptic Burn Pair. 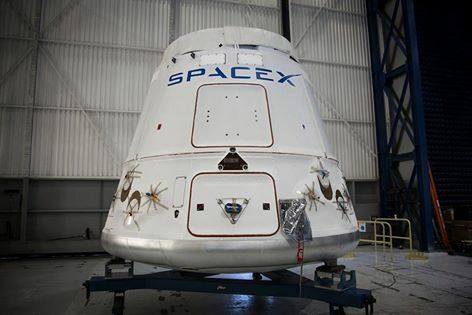 By Sunday morning, Dragon had reached an orbit of 393 by 395 Kilometers, approaching ISS from behind and below. Another pair of Height-Adjust/Coelliptic Burns put Dragon into an orbit 2.5 Kilometers below that of ISS and Dragon entered the ISS Communications Zone that stretches out as far as 28 Kilometers. 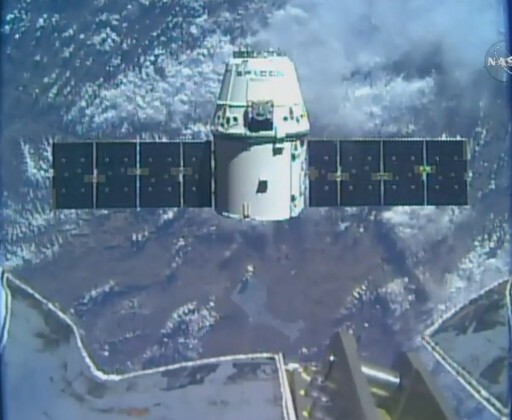 A UHF space-to-space communications link was established between the Dragon and the Station, allowing the two craft to begin exchanging GPS data in preparation for the switch to Relative GPS mode. 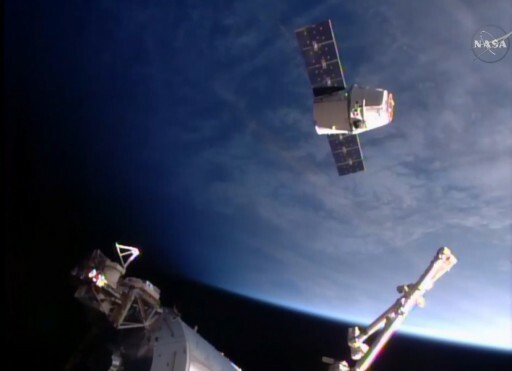 With Dragon on its way to ISS, NASA and SpaceX entered Integrated Operations between the ISS Mission Control Center at the Johnson Space Center and the SpaceX Dragon Control Center in Hawthorne, California. Dragon executed another pair of burns starting around 7 UTC to get into an orbit 1.4 Kilometers below ISS with minor course corrections carried out automatically along the way. Aboard the Space Station, the crew was looking forward to another long work day on Sunday, having had time off in the week to compensate them for having to work a full day on Sunday. Tim Peake and Jeff Williams started monitoring Dragon’s approach when the spacecraft reached 1,000 meters and tested their ability to command the vehicle through the COTS UHF Communications Unit. Dragon performed its 0.3m/s Approach Initiation Burn that placed it on a course from a point behind and below ISS to the Station’s R-Bar, an imaginary line connecting ISS and the center of the Earth. 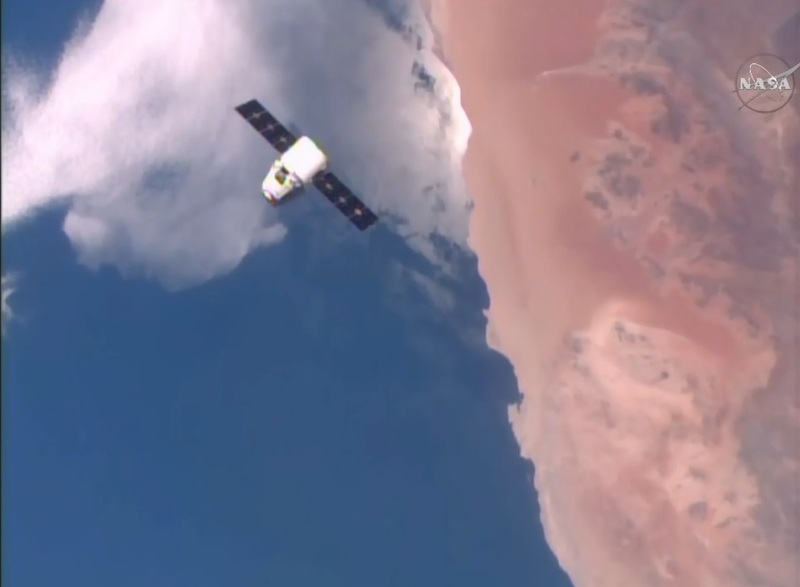 Dragon arrived at a point about 350 meters directly below ISS just after 9 UTC for a short hold facilitating a 180-degree Yaw maneuver to properly position the vehicle for a posigrade abort maneuver. Making its way up the R-Bar, Dragon switched from Relative GPS Navigation to the DragonEye Rendezvous Sensors consisting of a LIDAR (Light Detection And Ranging) and a thermal instrument used to acquire range, range rate and relative position data of Dragon and ISS. LIDAR measures the time it takes for a single laser pulse from the sensor to reach a target and bounce back to provide three-dimensional images of its Field of View. The thermal imagers acquire Infrared Imagery of the space station used to provide additional navigation data concerning relative position between the spacecraft that is compared with LIDAR data to make sure Dragon has accurate navigation information. A checkout of the navigation sensors was completed while Dragon paused its approach at 250 meters and a GO was given for Dragon to resume its climb and enter the ISS Keep Out Sphere. The crew kept close tabs on Dragon while it was moving up to ISS, employing a software known as Rendezvous and Proximity Operations Program (RPOP) that shows the actual spacecraft position compared to the expected vehicle outline at each stage of the rendezvous to allow the crew to assess Dragon’s position within the pyramidal approach corridor. 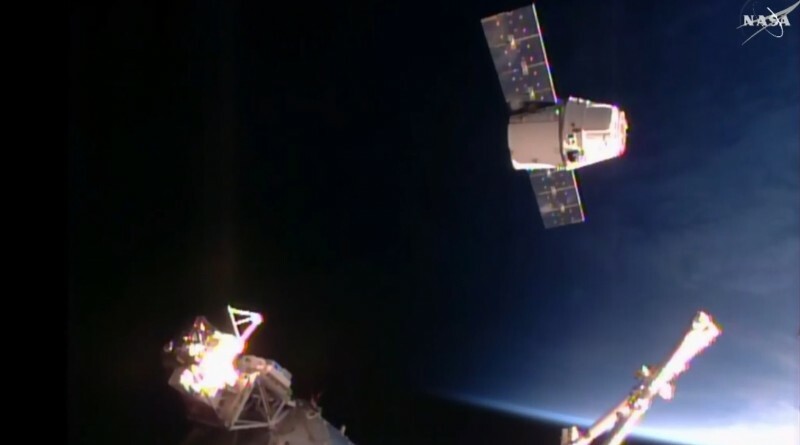 Dragon arrived at its next hold point, 30 meters from ISS at 10:40 UTC marking the start of the final setup steps of the robotic arm and external ISS Cameras to get ready for the capture. Teams in Hawthorne and Houston completed a quick check of Dragon’s position and systems, revealing all was still GO in Dragon’s rendezvous. Pulsing its Draco thrusters, Dragon initiated its final approach at 10:58 UTC to cover the last 20 meters to the Capture Point. 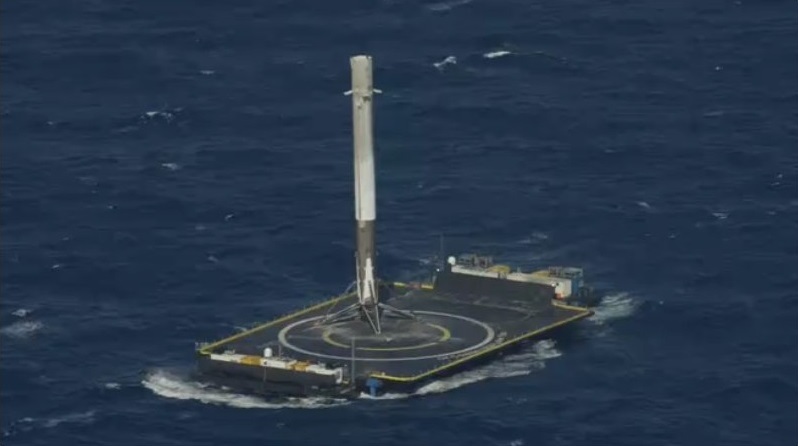 Final approach was very gentle, taking 17 minutes as Dragon only flew at a very slow relative speed. The vehicle arrived at the Capture Point at 11:15 UTC and the crew confirmed that Dragon had nulled out any relative rates and was holding solid at ten meters. Mission Control provided a GO for capture to the crew, a last call made from the ground to allow the team in orbit to work through their steps at their own pace without being disturbed. These steps included the reconfiguration of cameras to provide a good view of the capture and the release of brakes on the robotic arm. Flying the arm on Sunday was Tim Peake who used a camera on the Latching End Effector of Canadarm2 to track Dragon’s grapple fixture installed on the GNC Bay Door. 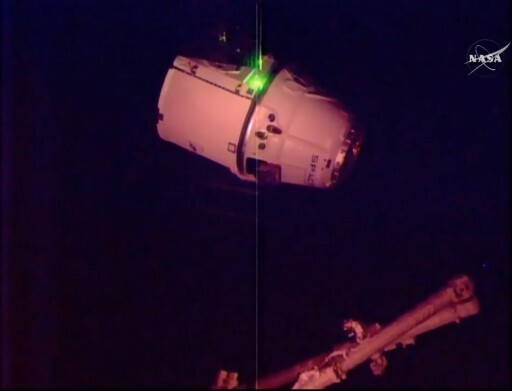 He used the hand controllers of the Cupola Robotics Workstation to align the LEE with the grapple fixture – a task slightly complicated by lighting conditions as ISS headed into orbital sunset right around the time Dragon reached the capture point. 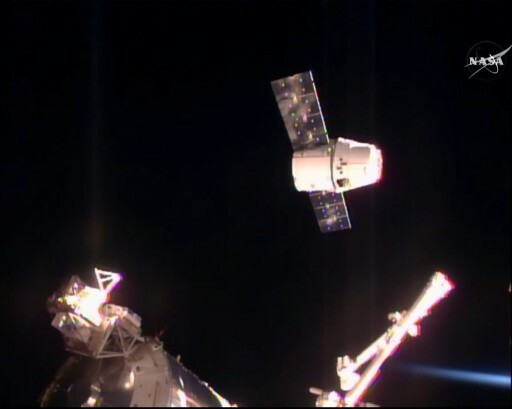 Dragon headed into Free Drift to prevent its thrusters from firing at capture and ISS entered a Fine Attitude Hold as the arm started to drive in for the capture. Once positioned over he grapple fixture, Peake commanded snares to close to get a firm grapple of the Dragon. Capture was confirmed at 11:23 UTC over 400 Kilometers above the Pacific Ocean, west of Hawaii, marking Dragon’s return to the Space Station after a flawless rendezvous with no technical issues or delays whatsoever. Once Dragon and Canadarm2 were confirmed in a safe configuration, congratulations were passed back and forth between the crew and teams on the ground. Initial post-capture reconfigurations were completed by the crew including the safing of the COTS UHF Communications Unit. On the ground, the SpaceX team configured the Dragon for its stay aboard ISS and ROBO Controllers assumed control of Canadarm2 after the crew reconfigured the Robotics Workstation. Over the course of several hours, the robotic arm was commanded to go through a range of motions, starting with a slow maneuver to the planned capture position from where pre-programmed maneuvers could be executed to transition Dragon to a standoff distance to the nadir Common Berthing Mechanism on the Harmony module. At this 2-meter standoff distance, Mission Control used external cameras to check the passive Common Berthing Mechanism on the Dragon for any foreign objects or damage to the O-Rings that form the pressure seal between the two spacecraft. 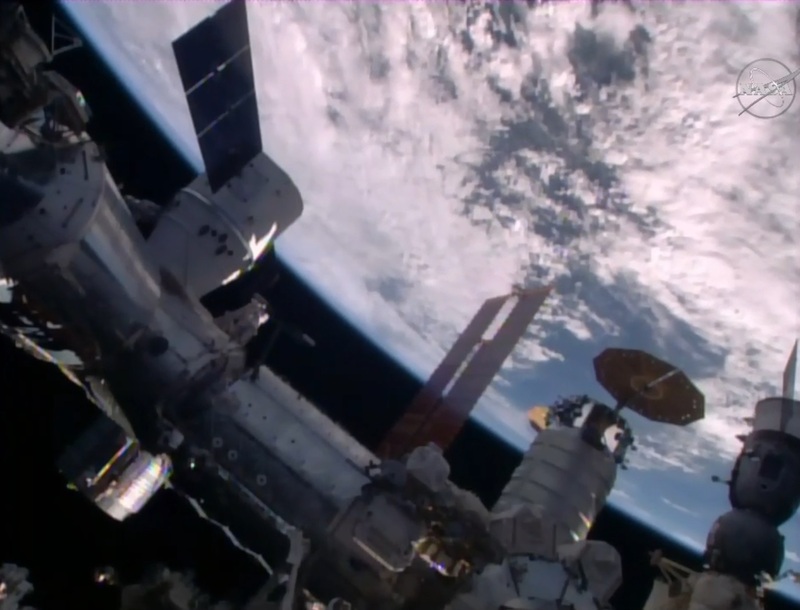 Also in this position, Dragon rotated its solar arrays to the correct position for the docked mission. 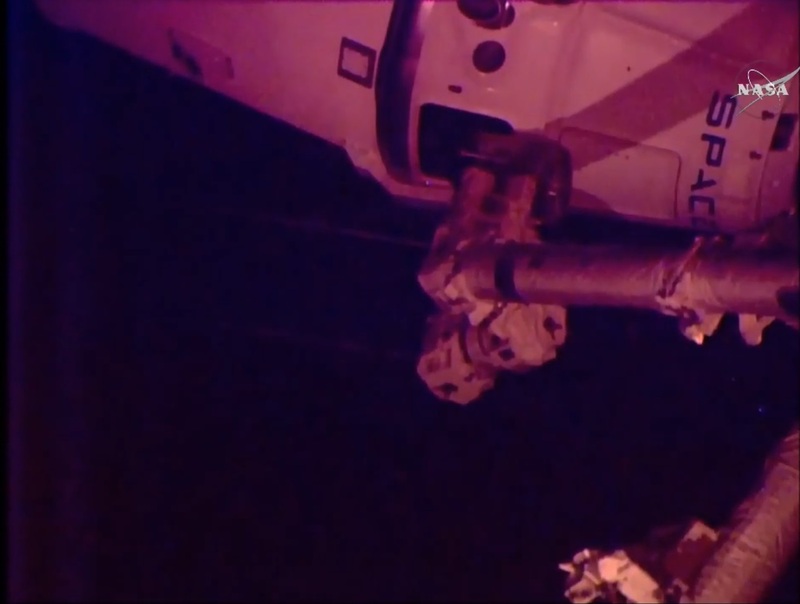 ROBO controllers then used the arm to move Dragon to the pre-berthing position at the nadir CBM of Node 2 that already opened the CBM pedestals prior to Dragon’s arrival. Using the Centerline Berthing Camera System, robotics controllers precisely positioned the Dragon until four Ready to Latch Indicators showed green, confirming that Dragon was in the proper position for berthing. Subsequently, the ISS crew took care of commanding of the Node 2 Active Common Berthing Mechanism – first closing four capture latches for first stage capture. When a good first stage capture was confirmed, the robotic arm was commanded to limp mode, giving Dragon some room to move as the CBM bolts pulled the vehicle in, driven in four sets of four bolts. Second stage capture was confirmed at 13:57 UTC, officially marking Dragon’s return to the Space Station. After a good second stage capture was verified and ISS was back in nominal attitude control, Mission control completed the hour-long task of loading each bolt with a specific torque. Next for the crew will be the lengthy leak check and vestibule outfitting task to set the stage for hatch opening, currently expected on Monday morning. 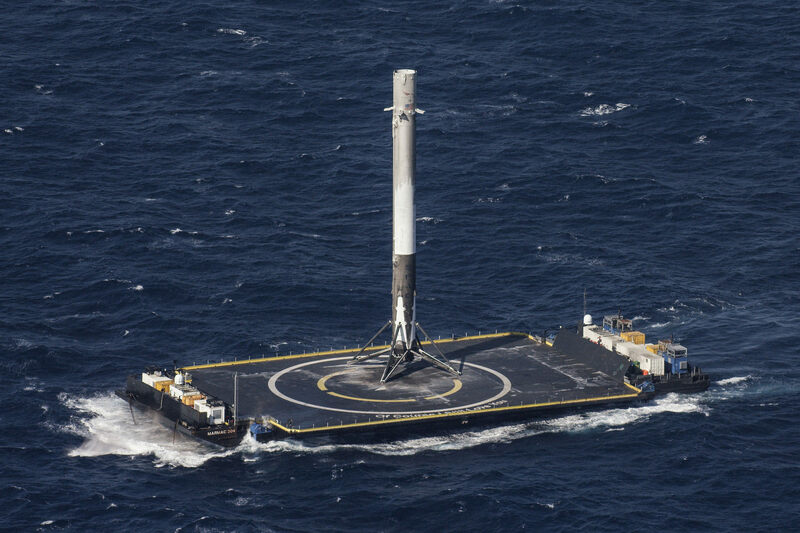 Dragon SpX-8 is booked for a stay of a little over one month with departure and landing currently penciled in for May 11.